Your "Pack Standard" Magic Flyer® starting at 100 units. Includes: custom duplex 1 double card 15 x 15cm or A5 + Standard + 1 Butterfly 1 envelope. 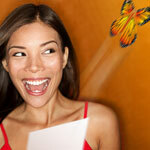 The butterfly comes to you already rewinded in the card and all inserted into the envelope, just send ... Upon opening your mail, your client will be surprised to see the flight of this incredible magic butterfly ! A moment full of feelings which your customer will not forget!